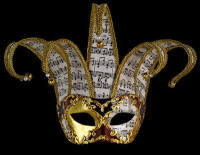 Gorgeous Italian styled Venetian masquerade party mask for the lady. 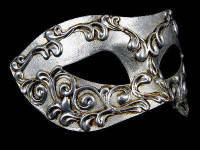 Ladies prove your designer chic with this gorgeous Gondola Luxury Masquerade Mask by Simply Masquerade. Ticking every trend box this stunning mask features a nero black papier mache base that displays the beautiful and dazzling clear Sworovski Crystal embellishment for a touch of sparkle. This stylish design will dress up all of your party outfits from fancy dress chic to masquerade ball glamour. 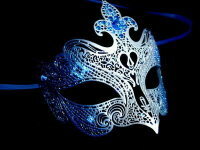 This mask has been handmade in the genuine Venetian tradition using the highest quality materials by the best mask makers in Venice....Certified authenticity. Mask Is Made From: Hand made Papier Mache - Perfect for a woman to wear.